A new year and new engine awards for BMW. This time, BMW North America received two awards from the Ward’s Automotive Group, once again, the twin-turbo 6 cylinder engine has won an award. The recently diesel engine launched in the U.S, 6 cylinder twin-turbo, grabs the second award for its EfficientDynamics technology and its V8 performance. The petrol engine has won the award three times in a row since its introduction in 2006. Back in December, we put together a comprehensive analysis on all the awards won by BMW engines in past 10 years. Once again, great job BMW! BMW of North America yesterday accepted two 10 Best Engines awards from Ward’s Automotive Group. As the only double winner this year, two BMW twin-turbo inline-6 engines — one diesel and one gasoline — were elected to the 10 Best Engines list for the 2009 model year by the Ward’s panel of expert judges. BMW’s gasoline 3.0-liter twin-turbocharged DOHC Inline-6 received a Ward’s 10 Best Engines honor for the third time since its introduction in the summer of 2006. 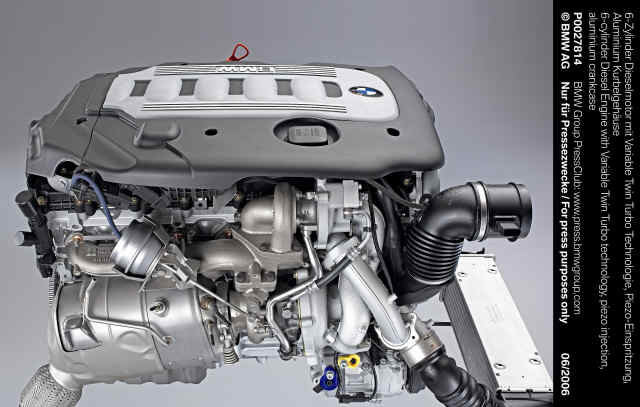 The acclaimed engine now powers 11 BMW models in the US – from the 135i to the X6 xDrive35i Sports Activity Coupe. This 300-horsepower engine features twin low-mass turbochargers, High Precision Direct Injection and electrified accessory drives for an unbeatable blend of power, efficiency, and responsiveness. As an example, this engine propels the BMW 335i coupe from rest to 60 mph in just 5.3 seconds (manual transmission) yet delivers an EPA-estimated highway mileage of 26 mpg. The second Ward’s 10 Best Engines honor for BMW was awarded to the new 50-state BMW Advanced Diesel with BluePerformance technology. Featuring all-aluminum construction, this light-weight 3.0-liter Sequential Turbo DOHC Advanced Diesel inline-6 offers V-8 performance on four-cylinder consumption: 265 horsepower and 425 lb-ft of torque, with EPA efficiency figures of 23 (city) and 36 (highway) in the 2009 BMW 335d Sedan, which is capable of 0 – 60mph in just 6.0 seconds. In addition to the 335d model mentioned, this new engine will also be available in the X5 xDrive35d Sports Activity Vehicle, which is capable of 0 – 60mph in 6.9 seconds and 26mpg on the highway. Both Advanced Diesel models will be in BMW centers later this month.